Learn how the industry is breaking down barriers to financing community-based solar projects. What is community-based solar? The U.S. Department of Energy defines community-based solar as a photovoltaic (PV) solar installation that falls within 100 miles of its electricity offtakers and is grid connected in the same utility service territory of these offtakers. The growth of community-based solar projects is the outcome of growing consumer choice, customer interest and community benefit. New and innovative financing methods and techniques must be utilized in order to sustain this growth. 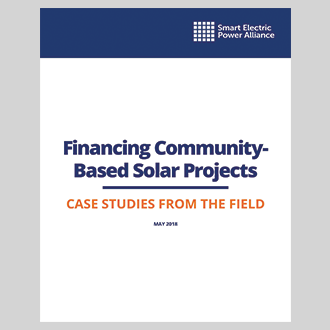 How are utilities and developers deploying strategies to reduce hard, soft and financing costs of community-based solar projects? Find out the answer in this report, funded by the U.S. Department of Energy’s Solar Energy Technology Office, which explores financing models through a series of in-depth interviews utilities and developers.